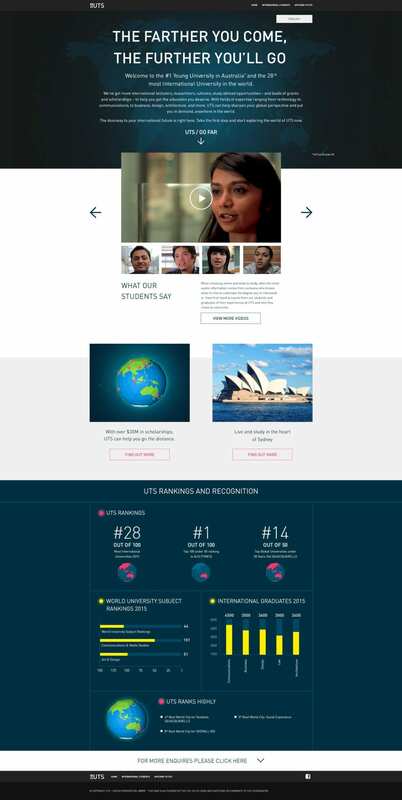 UTS HAS A BOLD VISION TO BE A WORLD-LEADING UNIVERSITY OF TECHNOLOGY. WITH STATE-OF-THE-ART CAMPUSES AND FACILITIES, UTS PREPARES STUDENTS TO BECOME GLOBAL THINKERS, LEADERS AND INNOVATORS. HOW DO WE ENGAGE WITH A GLOBAL AUDIENCE TO ESTABLISH UTS AS THE BEST PLACE FOR OVERSEAS STUDY WHEN IT DOESN’T HAVE THE GRAVITAS OF THE AUSTRALIAN SANDSTONE UNIVERSITIES? The Further You Come, the Farther You'll Go.